29 “Come,” he said. 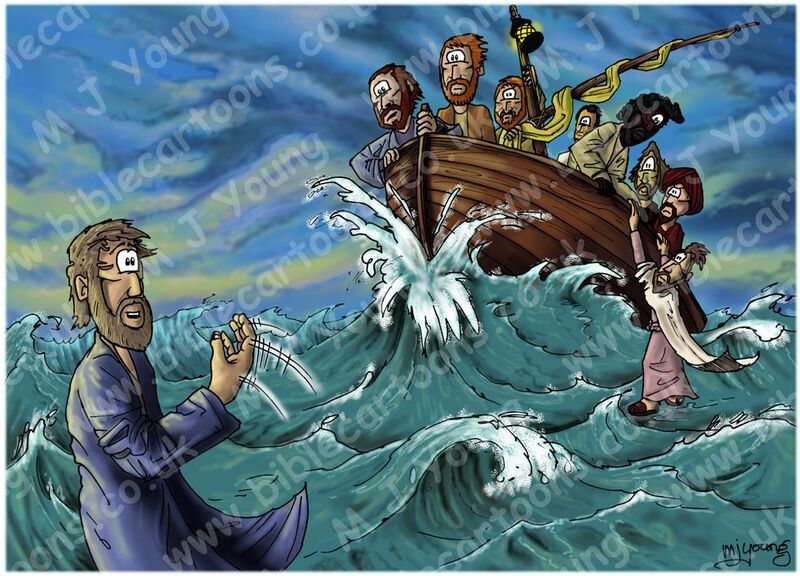 Then Peter got down out of the boat, walked on the water and came towards Jesus. There is very early morning sunlight, coming from the left of the picture, which is illuminating the scene. Notice that the left hand side of Jesus & the disciples have yellow sunlight on their edges. The yellow sunlight is also visible as a feint yellow glow in the clouds. On the left of this scene we have Jesus the Christ is standing on the lake water, beckoning Simon/Peter to walk to him. Simon/Peter is lowering himself onto the water, but here he is still; holding onto the boat. A note about facial expressions: Jesus is beckoning Simon/Peter with an expression of love, confidence & encouragement. Simon/Peter (hanging on to the boat, but nevertheless standing on water!) is looking wind-swept, but has his eyes fixed on Jesus. Andrew, James, John & Thomas/Didymus are all looking at Jesus with uncertainty. Matthew/Levi is smiling at Jesus & seems to be confident in him. Philip is looking at Simon/Peter & helping him over the side of the boat. Judas Iscariot is still scowling at Jesus in un-belief. In a typical wooden sailboat, the hull is constructed of wooden planking, supported by transverse frames (often referred to as ribs) and bulkheads, which are further tied together by longitudinal stringers or ceiling. Often but not always there is a centerline longitudinal member called a keel. The stem is the very most forward part of a boat or ship’s bow and is an extension of the keel itself. The stem is the curved edge stretching from the keel below [water], up to the gun wale* of the boat. The stem is more often found on wooden boats or ships, but not exclusively. The stem is part of the physical structure of a wooden boat or ship that gives it strength at the critical section of the structure, bringing together the port and starboard side planks of the hull. In my drawing, the timber stem comes up from the keel of the boat & extends above the gun wale (*or top most wooden plank that covers the heads of the timbers making the hull of the boat) making it a plumb stem. For more boat terminology see www.boats.com/glossary & click on the A-Z to read terms. Note that this link will take you off this website.